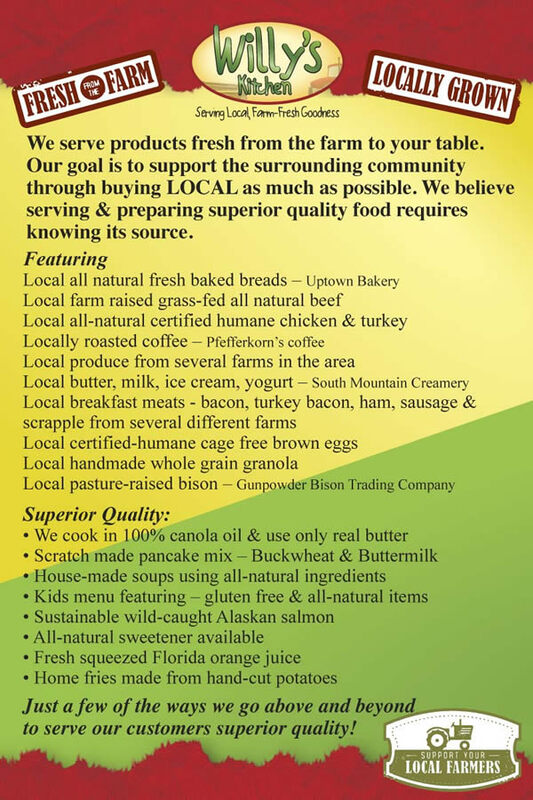 We are now serving LOCAL farm-raised, pastured ALL NATURAL meats which include Chicken, Turkey, Beef, Bison & Pork, LOCAL dairy products & produce. Breakfast items include - brown eggs from cage-free chickens, scrapple, uncured bacon, uncured ham steaks, all-natural turkey bacon. Also serving, LOCAL Maryland hand-picked crabmeat in our fresh-made crab cakes. Liberty delight farms - Reisterstown, MD - All natural pasture raised beef, pork products and eggs. At Willy's Kitchen we are proud to serve fresh, homemade, quality food at prices that you can afford. Now let's eat!! Welcome to Willy's Kitchen! We have been proud to serve the community of Ferndale since 2002. Thank you to our loyal customers who have attributed to our success. Without you we would not be here. Our main goal while you are a guest at our restaurant is for you to feel like family. So, please let us know if there is anything we can do to better accommodate you.